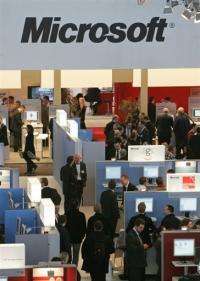 Fair goers visit the booth of software company Microsoft at a trade fair in Hanover. Information technology will be an employment machine, generating 5.8 million new jobs in the coming four years, according to International Data Corporation (IDC) research released. Information technology will be an employment machine, generating 5.8 million new jobs in the coming four years, according to International Data Corporation (IDC) research released. IDC predicts that the IT industry will be an engine powering economies out of economic doldrums, creating more that 75,000 new businesses in the next four years and adding jobs at a rate of 3 percent annually. While the world has been in the gripes of a recession, it has also been in the midst of a "technology renaissance" flush with advances in software, devices, and Internet-based services, according to IDC. IDC estimates that cloud services could add 800 billion dollars in net new business revenues between the end of 2009 and the end of 2013. "Over the past 20 years, we've seen transformative power in how investments in IT innovations foster economic growth," said Robert D. Atkinson, founder of the Information Technology and Innovation Foundation in Washington, D.C.
"Emerging markets are really going to take advantage of IT for years to come," Selby said. "One reason is they will be able to leapfrog and enjoy benefits of innovations like cloud computing much more quickly." Microsoft played up the prime role its software is playing in IT systems worldwide. Real IT employment gains have historically come from outsourcing customer support to 3rd world counties, recruiting a few over-decorated nerds, and supreme court sanctions for exploiting temporary labor. Except for a few nerds, the greatest impact will likely be temporary, for well wishers finding no career security and longing for real livelihoods. Is 5.8 million a worldwide figure? If so, what is that number of new jobs projected for the US? The US Dept of labor has talked often about 800,000 new IT jobs being created (+ another 700,000 replacement jobs) between 2006-2016, but this is only about 1/7 of the number mentioned in this article.